So much deliciousness to be had at Zoup!. I had no idea just how comforting their soups are or how much I needed their New Seasoned Bread Boules in my life. I had never been to a Zoup! restaurant up until a couple weeks ago. How is this even possible? I'm so glad I got to try them and I'll be back for sure. The soups taste like homemade and they are constantly rotating different soups on their menu daily. Zoup! is really great soup that makes you feel warm inside. YOU will get to go have your own experience free if you win my Zoup! gift card Giveaway below! I am giving away 5 $25 gift cards to 5 different people! Be sure to enter, the giveaway will end 11/12/17 at 12 am EST. I spoke with the owner of the Grand Rapids Michigan Zoup! location I visited and his passion for the company was positive and I understand why he enjoys being an owner. They offer 12 varieties of fresh authentic soups daily which also include low-fat, vegatarian, gluten free, and dairy free options. Sampling at the counter is also encouraged so that you can find your favorites. Zoup! also offers sandwiches, salads, and assorted desserts. My visit was specifically to experience their New Seasoned Bread Boules so I could share with you. I chose a few different soups they were offering that day to fill the boules with and I tried all three flavors of the boules. The texture is perfectly chewy but still wonderfully soft, they held the soup well and were a delicious treat to tear apart after. 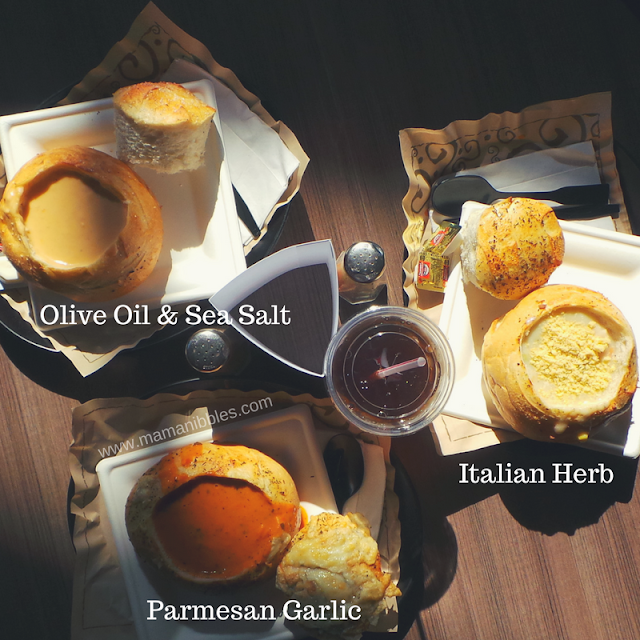 I think that the Parmesan Garlic boule was my favorite since I am a cheese lover and anything cheesy wins my vote. They were all quite heavenly though and really I could eat any of them on any given day and you will have no complaints from me! PS the new seasoned bread boules are only available through November 12th. They will still offer their original sourdough bread bowl year round. You must be US only to enter, 18 years of age and up, only 1 entrant per household is allowed. Giveaway will end 11/12/17 at 12 am EST. There will be 5 winners! The entry form below may take a moment to load, thanks for your patience. GOOD LUCK!